To Cite: Kolahdouzan M, Abtahi S H R, Abedini L, Jafari H R, Mostafapour E. The Case Report of Laryngeal Adenoid Cystic Carcinoma: A Rare Entity, Int J Cancer Manag. 2017 ; 10(5):e7213. doi: 10.5812/ijcm.7213. Introduction: Laryngeal adenoid cystic carcinoma (LACC) is a very rare cancer among laryngopharyngeal malignancies with varieties in presentation. Case Presentation: Here, we discuss a case of 54-year-old female who was admitted in the emergency department with long-term dyspnea, hoarseness, and stridor. Cervicothoracic multi detector computed tomography (MDCT) scan showed a mass in the laryngeal area and the pathology reported adenoid cystic carcinoma in the biopsy. Total laryngectomy and partial pharyngectomy was taken into action. The adjuvant radiotherapy was performed too. Conclusions: Although adenoid cystic carcinoma is rare, it is advised to use both CT-scan and deep biopsy to make definite diagnosis. Surgical excision is necessary and follow up is advised, although surgical excision of this tumor is extremely challenging case by case. Adenoid cystic carcinoma (ACC) is one of the common types of minor salivary glands tumor, but the involvement of the glottis by this tumor is very rare. According to the body of literature the incidence of laryngeal adenoid cystic carcinoma (LACC) is 0.005/100,000. Only 69 cases of LACC from 1977 - 2011 were reported on web (1, 2). LACC has subtle presentation for months in most cases, because of slow growing pattern. However, in symptomatic cases, the disease is usually presented with change of voice, hoarseness and dyspnea (3). In advanced cases, neck pain could be presented because of prineural extension of tumor (4). Management of the LACC, like in other places, is the complete surgical resection with safe margins, but surgical management of LACC for the function of the larynx has high morbidity. Because of high recurrence rate for this tumor, difficulty for achievement of safe margin, and submucosal extension of tumor, adjuvant radiotherapy is recommended (1, 3). A 54-year-old female, who was a known case of bronchiectasis from 4 years ago, was admitted in the emergency department with progressive dyspnea from 8 months before. She also complained about voice hoarseness. Her physical exam had no findings of palpable neck mass or lymphadenopathy in the neck area, but we found a prominent stridor at auscultation of major airway. The patient’s lab data was non-specific. Therefore, she underwent chest x-ray and pulmonary function test in considering dyspnea. The pulmonary function test showed obstructive pattern of major airway. Our next step was cervicothoracic multi detector computed topography (MDCT) scan with IV contrast. Although the x-ray was normal, the CT scan showed a cystic and solid mass in the posterior area of larynx which was extended to left paraesophagial space in thoracic inlet [Figure 1]. After detecting the abnormality in the CT scan, laryngoscopy was done and biopsy from deep mucosal layer of the suspicious area was taken. 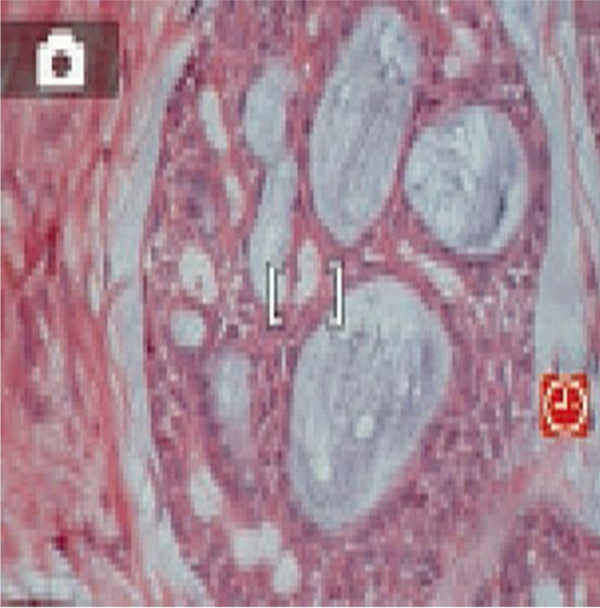 The pathology report of the biopsy confirmed adenoid cystic carcinoma with cribriform pattern [Figure 2]. The patient became a candidate for total laryngectomy. At operation we found an extended involvement of the larynx and anterior wall of pharynx, so we had to carry out partial anterior pharyngectomy of the anterior wall of hypopharynx in addition to total laryngectomy [Figure 3]. Furthermore, partial resection of trachea and a permanent teracheostomy was done. There was not any lymph node involvement and tumor margins were clear grossly and in microscopic evaluation. Laryngeal adenoid cystic carcinomas (ACC) are malignant, slow growing with recurrent incidence and distant metastasis. Diagnosis is challenging, since ACC tends to invade deeply into submuosal area. Laryngeal ACC mostly grows in subglottic and supra-glottic space and according to our literature review, about ten glottis ACC have been reported till now. 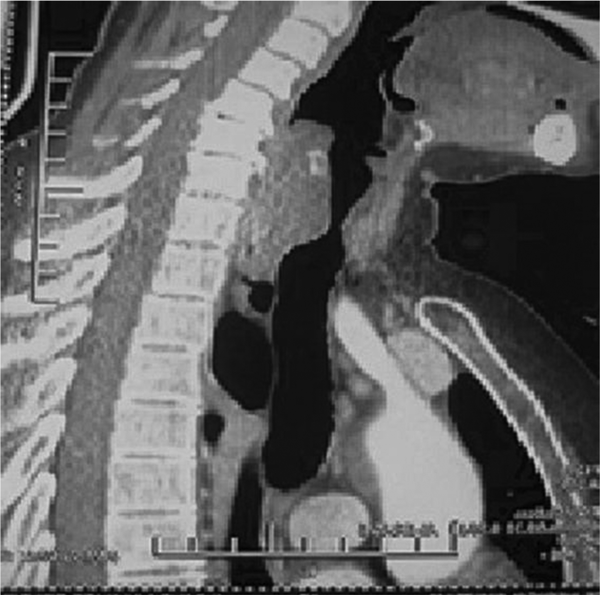 Neck metastasis is a rare incident in ACC patients (3, 5). Small laryngeal carcinomas are usually asymptomatic. The symptoms and signs are dependent on the involved area and tumor size. If ACC is located in the supra-glottic area, the patient can be presented with dysphagia. On the other hand, subglottic growth may cause upper airway obstruction and stridor. Moreover, hoarseness can represent glottis involvement. Some studies claim that painful feeling in the pre-laryngeal area can be an important sign to focus on in advanced ACC patients (3, 5, 6). It is necessary to perform imaging and histopathological analysis before operation since squamous cell carcinoma is one of the aforementioned differential diagnosis. ACC histopathology reveals that it can be separated into 3 subtypes. Cribriform, the most common type, is consisted of small uniform cell in cribriform growth pattern. Tubular has the best outcome while solid is indicative of poor prognosis. CT scan is the most useful tool in diagnostic process of ACC. It can assess ACC metastasis, location, and intra and extra luminal invasion. But there is a pitfall in using CT scan, since it may not detect sub-mucosal growth. Thus, normal CT scan poses challenges in the course of diagnosis and decision making. Although there are other alternative diagnostic methods such as laryngeal MRI, CT scan with contrast, and direct laryngoscopy, cervicothoracic CT scan remain the foot stone in the imaging process of ACC (3). In our case, first, the tumor was diagnosed in the CT scan and it was confirmed and identified in biopsy. ACC treatment is still controversial due to rarity and slow growing nature of the tumor. There are various management strategies in treating ACC such as radiotherapy, chemotherapy and surgery. Radiotherapy has little curable impact on ACC while this type of tumor is sensitive to radiation. Despite all the mentioned facts, there is valid evidence that radiotherapy adjuvant to surgical resection can reduce the incidence of regional recurrence and improves prognosis. Chemotherapy can be another adjuvant therapy for advanced tumors with distant metastasis besides surgery and radiotherapy. On the other hand, some studies claim that chemotherapy exposes patients to unnecessary toxins, since it has minimal effect on solid tumors (3, 5, 6). Surgical management is the mainstay in treating ACC which cannot be ignored. Total laryngectomy with wide margin resection is the most accepted method among authors. Some prefer partial laryngecotmy, but there is a risk of lymphatic vessel and preneural spread and sub mucosal involvement. Neck dissection should be done based on the clinical confirmed lymph node metastasis (3, 5, 6). Our case underwent radiotherapy after her surgery and her condition was followed 6 months after the first year radiotherapy. All in all, laryngeal adenoid cystic carcinomas are rare malignancies of the neck which have no or non-specific symptoms and signs. So based on its rarity, we advise the use of CT scan with contrast. Furthermore, if a suspicious mass is seen in this region, it is advised to take a deep biopsy since CT scan result is not diagnostic in submucosal pattern of tumor growth. In our treatment plan, we suggest surgical approach of total laryngectomy with wide safe margin which is followed by radiotherapy. It is important not to forget that a 6-month follow up after the last radiotherapy session is necessary in order to rule out tumor recurrence.